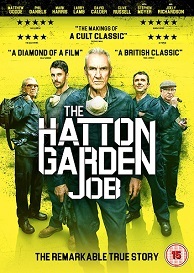 The Hatton Garden Job is out on DVD on 12th June and to celebrate we have a great competition for you and 3 copies of the DVD to give away. A remarkable true story set over one long Easter weekend; THE HATTON GARDEN JOB follows four ageing East End criminals led by 76 year-old Brian Reader and one mystery man who pull off the largest heist in English legal history. With everyone from the Hungarian mob to Scotland Yard on their tail, these old-school and just plain old villains set about achieving the seemingly impossible, drilling into a steel-and-concrete secured safety deposit vault in London s well-to-do Hatton Garden jewellery quarter. THE HATTON GARDEN JOB proves once and for all that crime doesn't pay when you're on a pension. Who directs The Hatton Garden Job?